Over 25 years ago when I rented my first apartment in San Francisco I bought some starter furniture at an estate sale - a couch, a couple of chairs, kitchen table and a desk which was about the size of a small piano (and as hard to move). Over the years the couch, chairs and table ended up on various Bay Area, NYC and Brooklyn curbsides. But I always liked the desk and told myself one day I'd have it refinished. For a coupe of decades it was looking pretty unlikley I would ever get to do anything with it other than have it collect dust while it slowly but inevitably fell apart ... ultimately joining its cohorts on the curb. Finally, last summer after dragging this thing around the country to the variety of places me and my family lived over the year it was now or never. So I got out my respirator, face mask and rubber gloves and got to work. 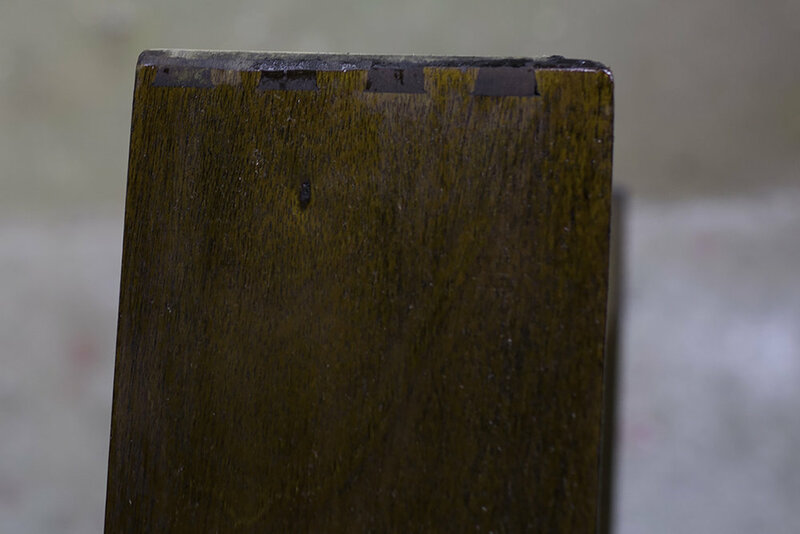 The desk had countless layers of black paint and varnish which took hours to remove using chemical strippers and sanding. Using relatively safe chemical strippers meant a lot of time with the scraper, gloves and respirator. Sanded down using progressively finer grit and finished with Spar Varnish to retain the natural color. The joinery dated the piece to early 1900's. There's no makers mark but experts believe it was made in New England. I thought the panels were veneer but it turned out the entire piece is solid Mahogany. The desktop is made from three panels of solid wood - which was lucky since I would have "burned" through veneer. The finished piece turned out much better than I could have imagined so lugging it around for 25 years was worthwhile after all.